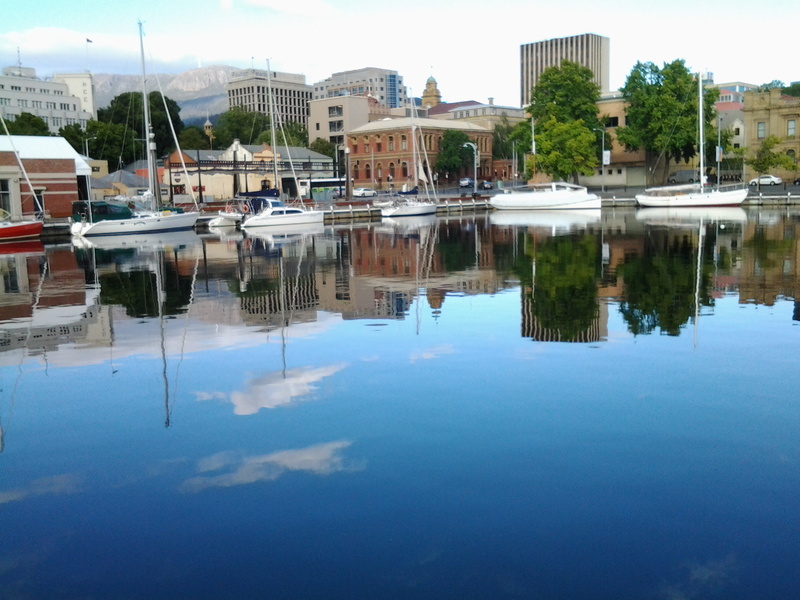 On Stage 11, after walking along Hunter St, I turned right to walk along the Franklin Wharf street, and had the Derwent River on my left and an enclosure for fishing and other vessels to my right. The morning was fresh, the sun was shining and it was all together delightful. Not many people around. 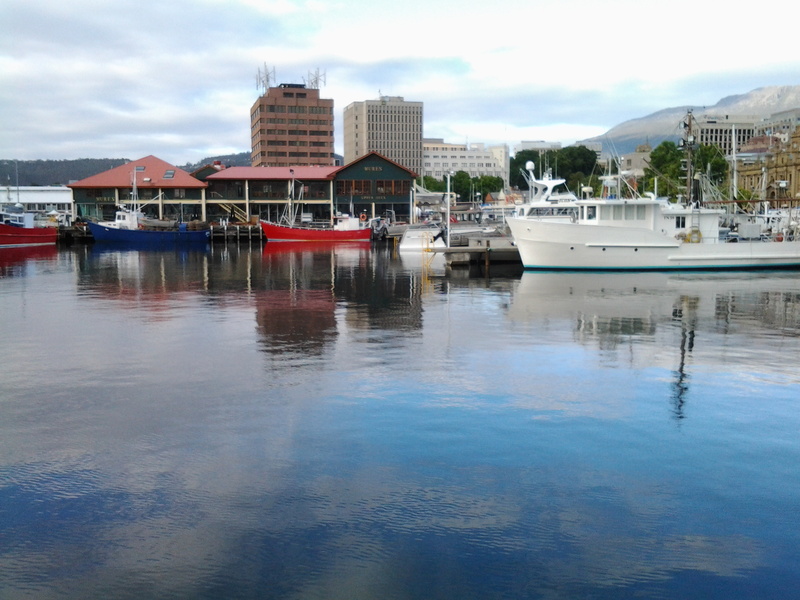 The mountain, clearly visible, looked down on the centre of Hobart and over the wharves. Clouds were reflected serenely in the water. 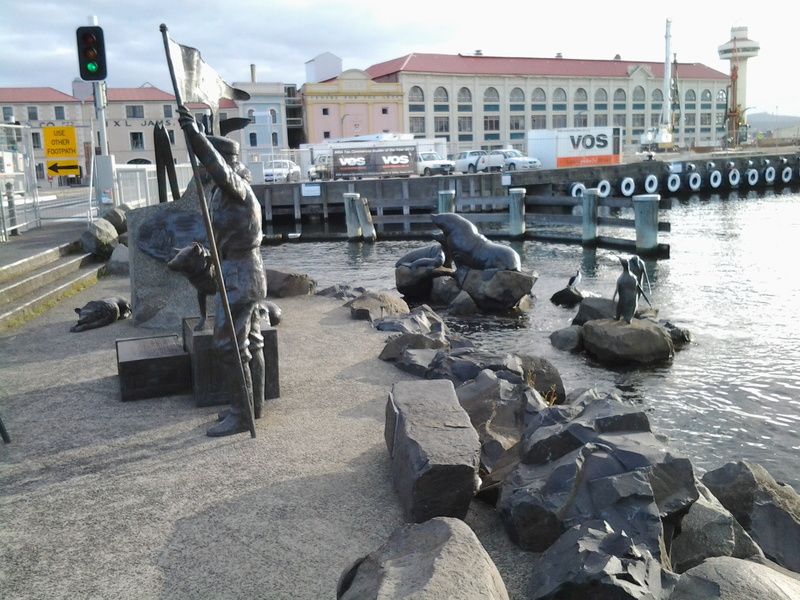 A family of bronze sculptures, perched life-like on rocks on the River side, is much loved by visitors. Passing Mures fish restaurant on my right, I continued on until I could see the row of floating fish shops selling fresh and cooked fish and other seafood. 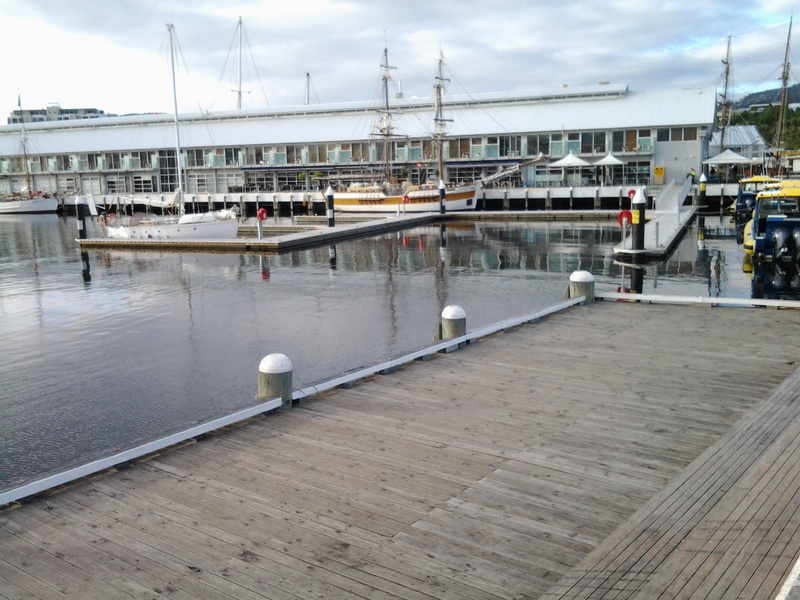 A minute later, I was standing on the celebration platform used when the Sydney to Hobart Yacht race boats arrive. I looked across to Elizabeth Pier which contains accommodation, conference facilities and a number of eateries (where sitting outside is such a pleasure). 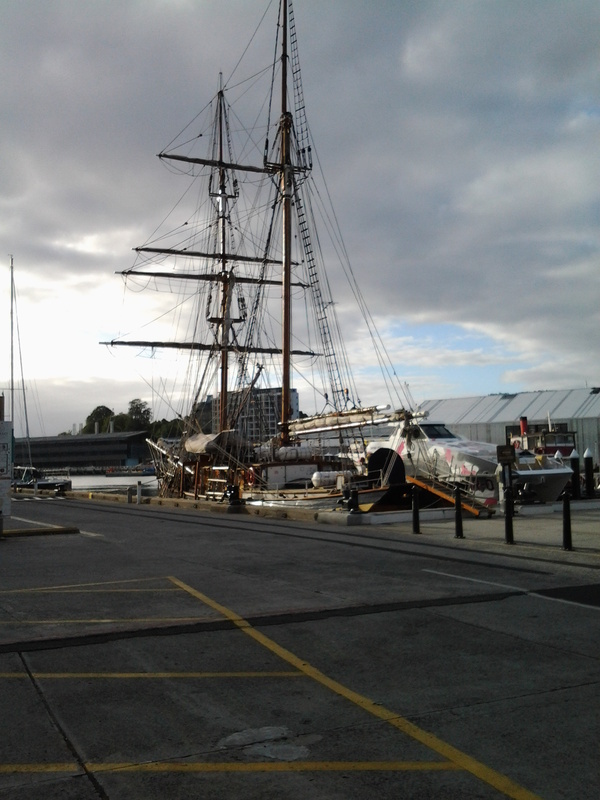 In the photo below the ‘tall-ship’ replica Lady Nelson sits outside the T42 restaurant. Opposite Elizabeth St pier, a number of buildings of different architectural styles and vintages line part of the street. 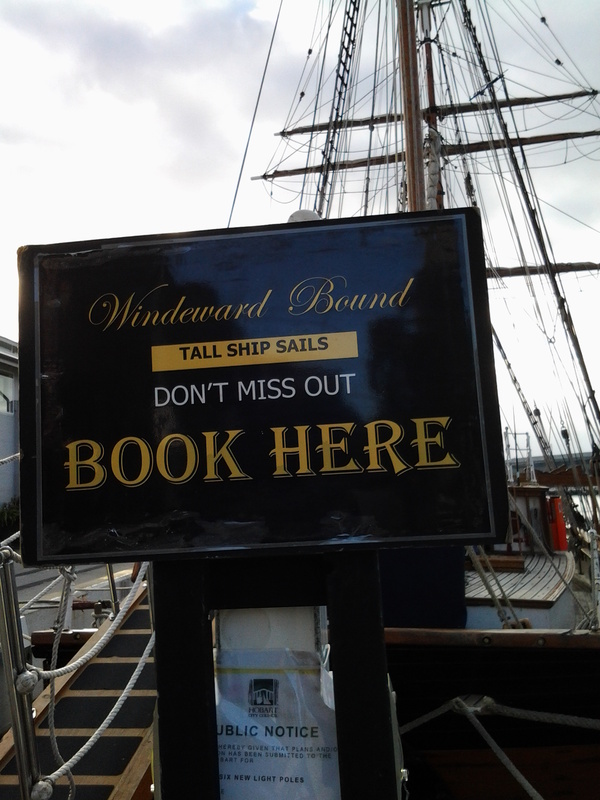 Continuing to the other side of the Elizabeth St pier, a second tall ship, the Windward Bound offers sailing trips. On the next pier after the one in the photo above, a couple of the contemporary camouflaged MONA ferries sat either side within the slightly mobile surface of beautiful glassy water. 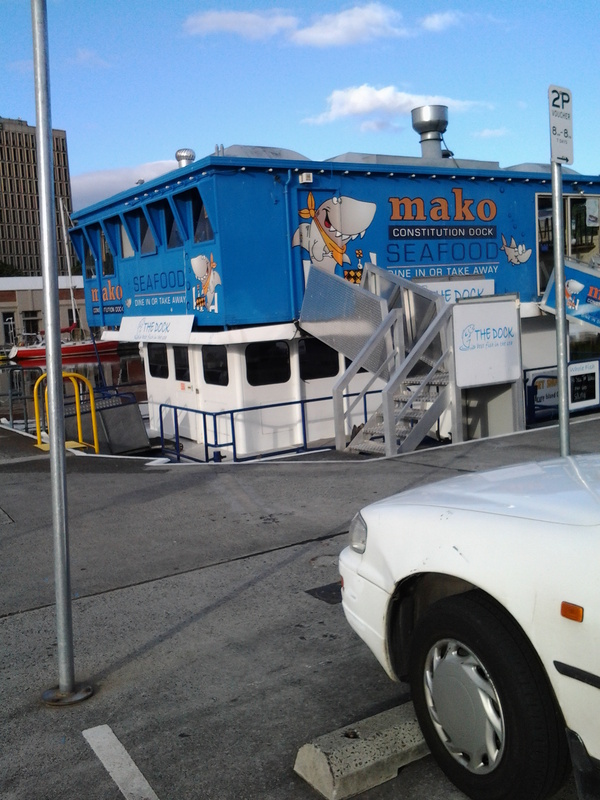 Taking a trip on these ferries down the Derwent to and from MONA (Museum of New and Old Art) located in the suburb of Berriedale (I walked through that on recent Stages) helps you to see parts of Hobart you would not normally see, and it gives you a perspective on the distances over which the Greater Hobart Area sprawls. 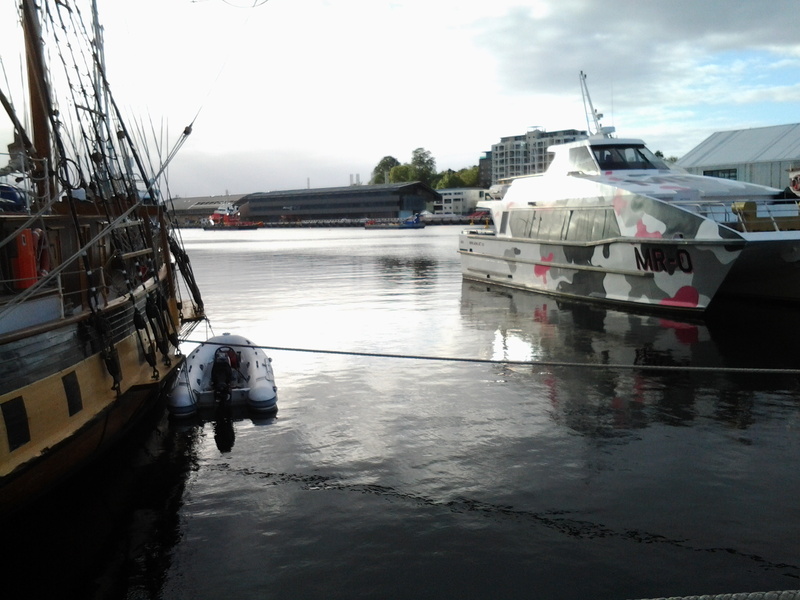 It is interesting to reflect on the two extremes of water vessel technology, when you look at the 19th century sailing ship close by a state-of-the-art catamaran. These starting sections of my Stage 11 were colourful and tranquil. 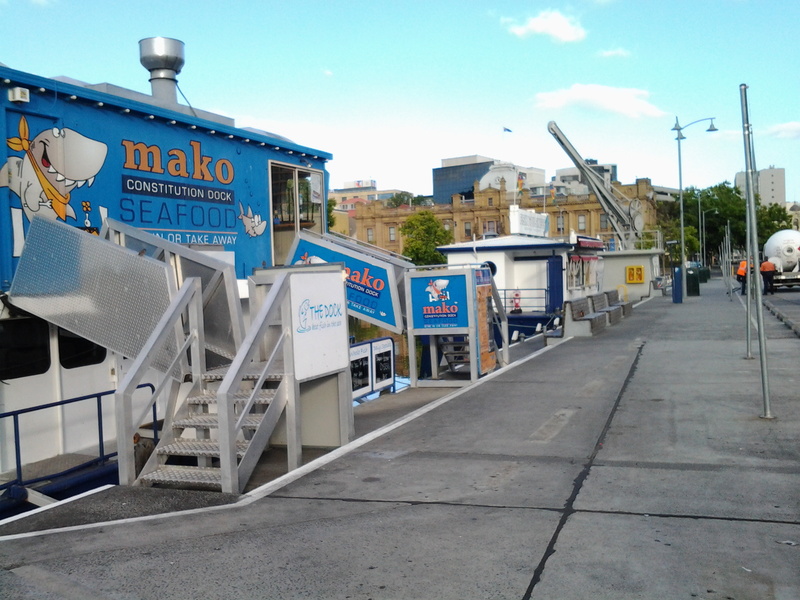 It’s a free, easy, stroll along the waterfront and there is much to see looking out onto the side of the Derwent River. The next posting on this blog will look at landmarks on the non-River side of the streets. 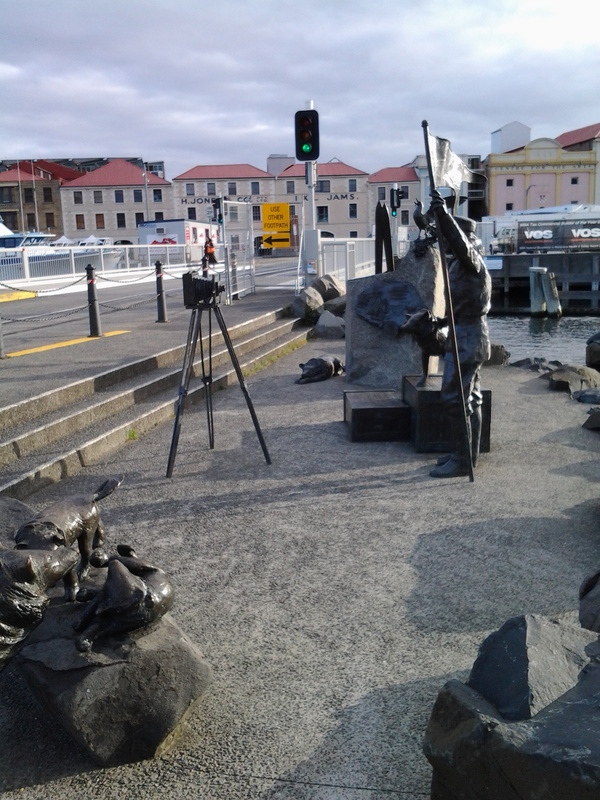 This entry was posted in Derwent River, Hobart, Mount Wellington, Tasmania, Walking and tagged Berriedale, bronze sculptures, Elizabeth Pier, Franklin Wharf, Greater Hobart Area, Hobart, Hunter St, Lady Nelson, MONA, Mures fish restaurant, Museum of Old and New Art, Sydney to Hobart Yacht Race, T42, wharf, Windward Bound on January 24, 2015 by Tasmanian traveller. Beautiful photo of the clouds mirrored in the water! Should blow it up and print it and frame it! Please do so for your house if you wish. I am deliberately not putting a copyright or any other legal protection on my photos in case someone wants to use them, be inspired to do something similar and let the world see, etc. Glad that you liked the photo. 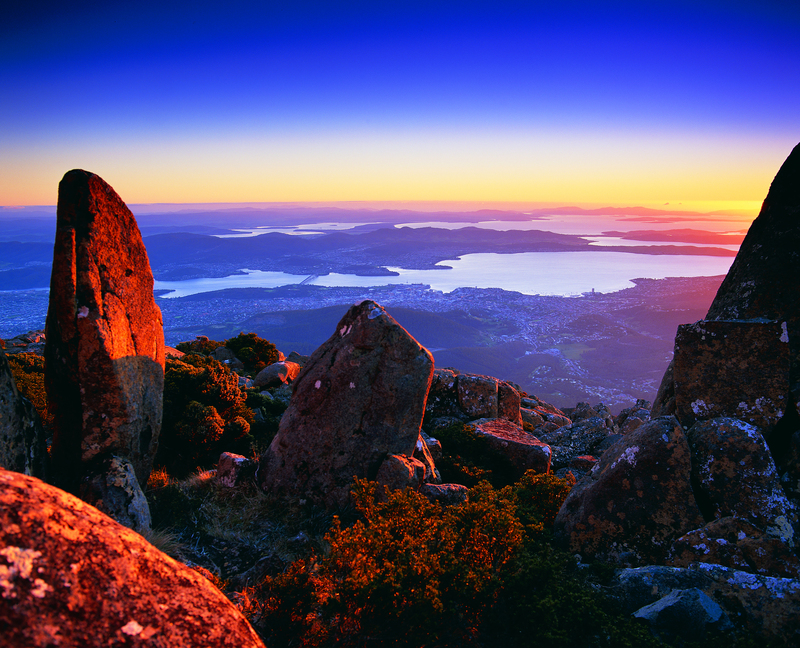 It is the beauty of Tasmania that provides such wonderful images. I was very happy to be at that location so early in the morning and able to experience that view.